Finland is among the most wetland-rich countries in Europe. The ecological and geological characteristics of the country, as well as its climate history, have promoted paludification and the formation of peatlands and alluvial strata. Nevertheless, little archaeological research has been conducted in Finland’s wetlands. Satu Koivisto’s doctoral dissertation Archaeology of Finnish wetlands: With special reference to studies of Stone Age stationary wooden fishing structures addresses this significant lack of information. The dissertation focuses particularly on Stone Age wooden fishing structure remains. Wetland archaeology is defined as the study of areas and finds that are either temporarily or periodically waterlogged, such as swamps, fens, bogs, marshes, rivers, lakes, coastlines, and floodplains. Organic materials such as wood, leather, textile, antler, and bone can be preserved in saturated, anaerobic conditions for centuries or even millennia. The best-known archaeological remains immersed in wetlands include bog bodies, causeways, boats, and settlement structures. The preserved sites and the artefacts they contain help archaeologists study how past populations used different materials. They also provide clues as to what kinds of materials or structures in dryland archaeological sites may have deteriorated and been lost over time. In addition, wetland archaeological sites and their strata are a significant research resource for studies in environmental change. Stationary wooden structures associated with fisheries are currently the most common type of wetland archaeological site in Finland. Based on securely-dated samples, similar fishing structures have been used for millennia, from the Stone Age until the early modern period, from c. 4000 BCE until the beginning of the 20th century CE. Koivisto’s research results have established that waterlogged wooden structures are a valuable subject for study and can help researchers reconstruct prehistoric fishing methods, technological solutions, and subsistence strategies. “We also know of prehistoric settlement sites, cemeteries, and causeways buried in overgrown waterways, but very few of these have been excavated in Finland. The areas with the highest potential for finding new sites include river estuaries, areas affected by post-glacial rebound, and overgrown lakes” says the doctoral candidate. The lack of effective methods for discovering and studying new sites has hampered wetland archaeology in Finland. 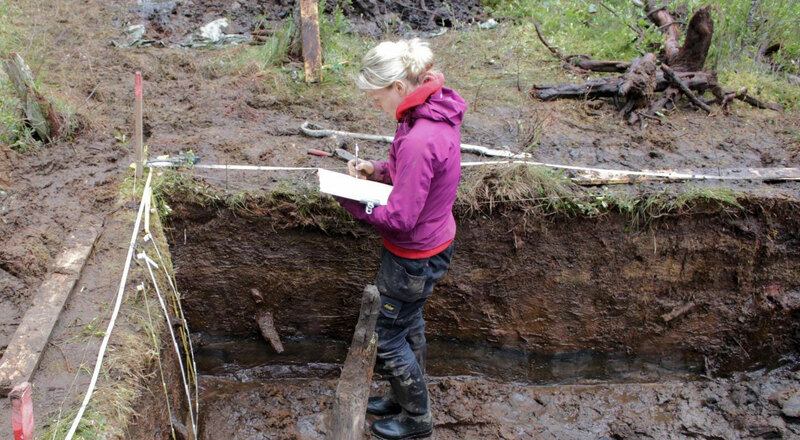 During her research, Koivisto discovered a great deal of new information about archaeological sites in wetland areas, and she also proposes new methods for finding more. “We should have started surveying for sites much earlier, because the fragile wetland areas are gradually and inexorably being destroyed. The most critical threats to the preservation of archaeological resources in the wetlands are posed by drainage, peat harvesting, soil acidification and climate change,” notes Satu Koivisto.